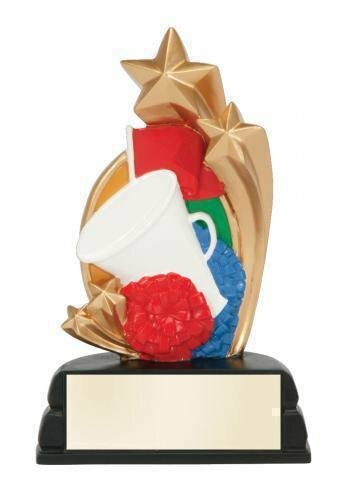 These full color star resin trophy awards come in a variety of activities for many different award presentations. The star lets each recipient know they are a star player. A perfect award trophy that will be cherished for years to come. Full color enhances this Star Basketball award. The orange basketball with black piping, a white backboard set in front of a basketball court complete with wood colored strips bring this award to life. Gold stars in a variety of sizes appear to be shooting around several areas of the award to give it a dynamic look. 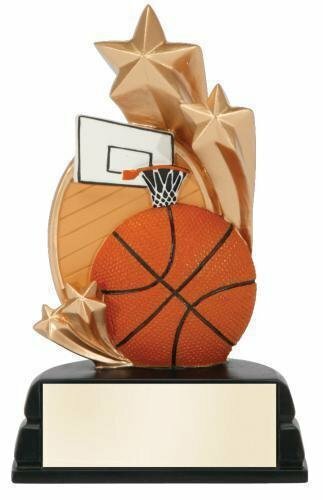 The Star Basketball award stands 6" tall and has an ample base that can accommodate just about any of your engraving needs. This is an award that anyone would be proud to either give or receive. Full color enhances this Star Cheerleader award. The white megaphone, along with a red pom pom, drill team flag bring this award to life. Gold stars in a variety of sizes appear to be shooting around several areas of the award to give it a dynamic look. The Star Cheerleader award stands 6" tall and has an ample base that can accommodate just about any of your engraving needs. This is an award that anyone would be proud to either give or receive. Full color enhances this Star Football award. The brown football with detailed white finger lacing and goal post are set in front of a football gridiron complete with green grass and white field markings that bring this award to life. Gold stars in a variety of sizes appear to be shooting around several areas of the award to give it a dynamic look. The Star Football award stands 6" tall and has an ample base that can accommodate just about any of your engraving needs. This is an award that anyone would be proud to either give or receive. Full color enhances this Star Soccer award. 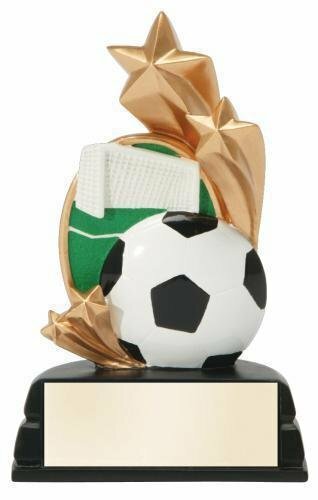 The black and white paneled soccer ball and a detailed white goal are set in front of soccer pitch complete with green grass and white field marking that bring this award to life. Gold stars in a variety of sizes appear to be shooting around several areas of the award to give it a dynamic look. 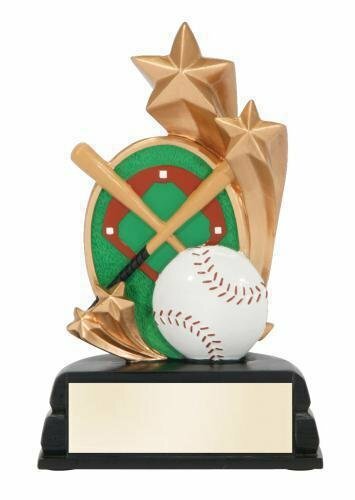 The Star Soccer award stands 6" tall and has an ample base that can accommodate just about any of your engraving needs. This is an award that anyone would be proud to either give or receive. Full color enhances this Star Softball award. The yellow softball with detailed red stitching, crossed baseball bats all set in front of a baseball diamond complete with green grass, white bases, and a dirt colored infield bring this award to life. Gold stars in a variety of sizes appear to be shooting around several areas of the award to give it a dynamic look. 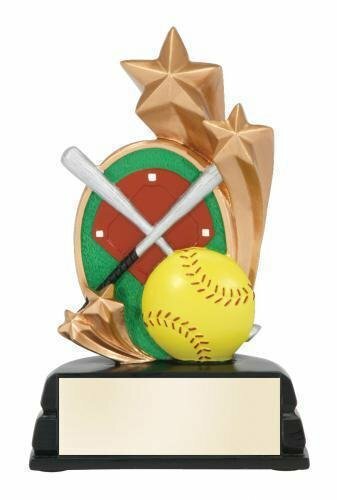 The Star Softball award stands 6" tall and has an ample base that can accommodate just about any of your engraving needs. This is an award that anyone would be proud to either give or receive.